This update is, as usual, a bit behind schedule. I have been workin'. 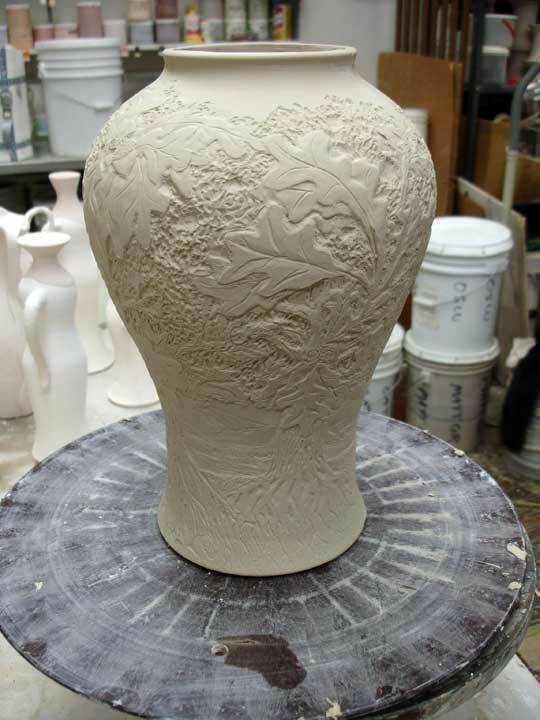 I am now glazing, but these photos go back a month so you will still see some things being made. 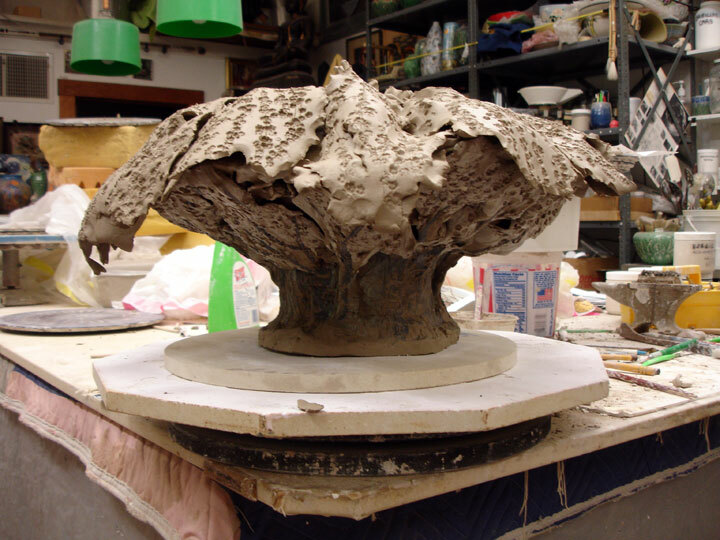 This piece is meant to depict "Spring" and is a centerpiece bowl. It is 14" wide in this picture. It will shrink down 1 1/2" before it is finished. and there are a couple of bigger ones about 14 x 8". They will have ceramic doors on the bottom and the ears are slots for your saved coins. This is another "Spring" image of a weeping cherry in bloom. It is not yet finished in this picture. I showed you the inspiration for this piece in my last update. Ok, I am switching over to glazing and had to give the studio a super clean. It is not often when I move everything on the floor to clean. The glaze kitchen is all clean and orderly, but I still have mix and refresh all the glazes. I looked at the kiln and the elements worry me. They look bad, but they still function well. 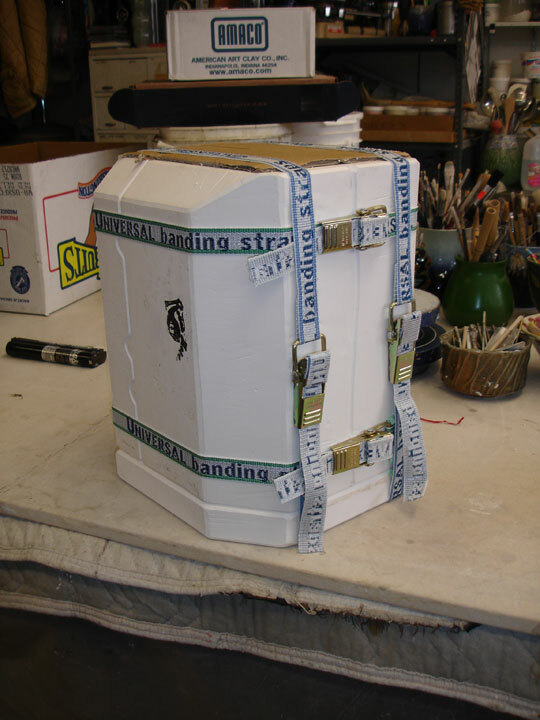 My kiln is built for power and these elements are extra heavy and deliver what I need. 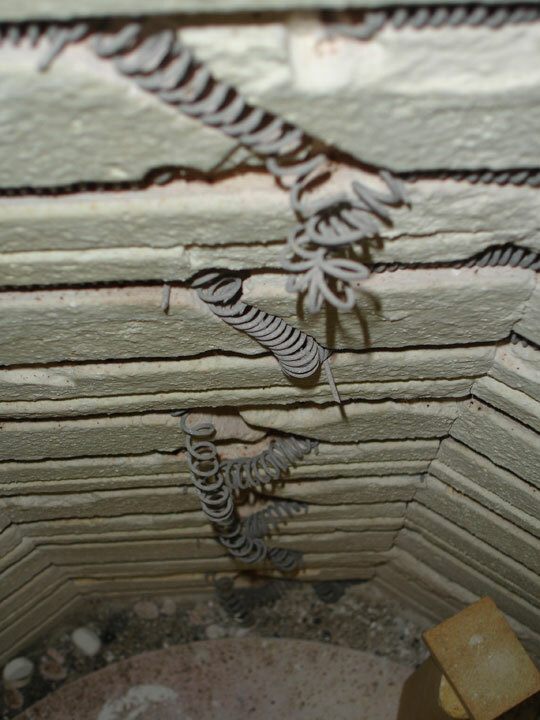 Still, I called my kiln guy and asked him to wind me a set of coils. 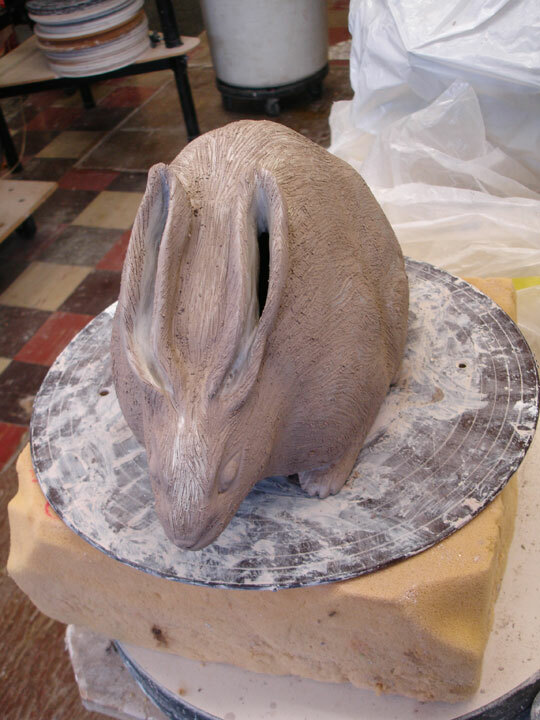 I can't have the kiln go down because I am way behind schedule for glazing. 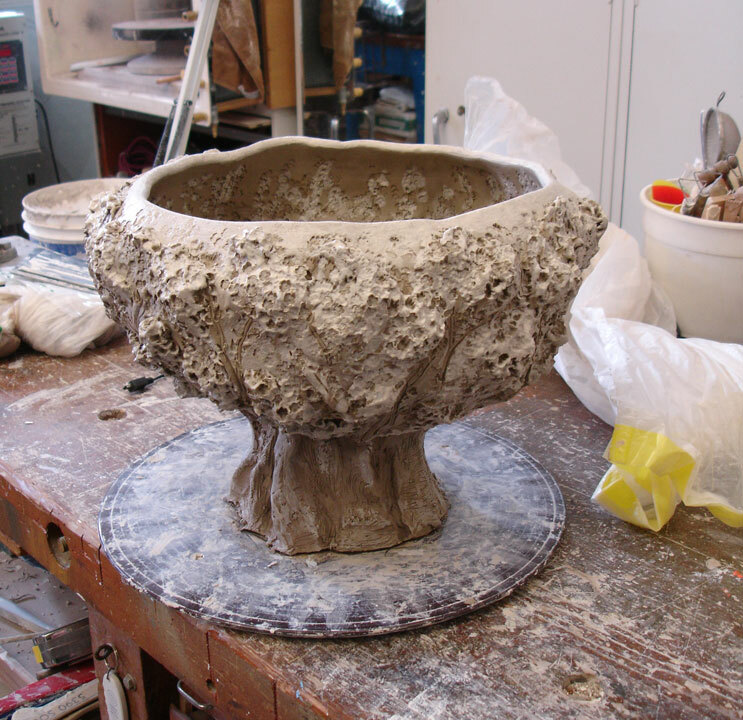 Just as I finish making for the cycle and the studio is all clean from clay being tracked everywhere, my mold for my Oak Tree Pot arrived from New York. Well, I wanted to be able to glaze and present this piece, so I cast three of them for this year. Taking a break and sitting in the yard, I wondered if I should make an Iris design this year? 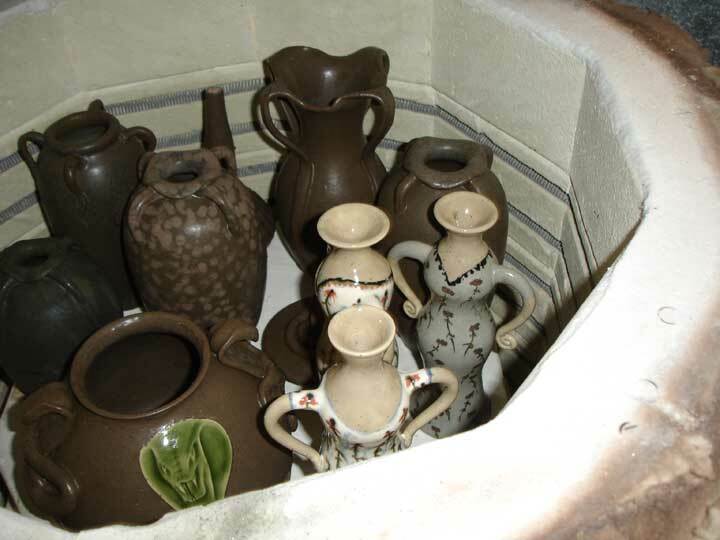 I have some very unusual pots this year that don't fit the "A&C" or the traditional "art pottery" categories. 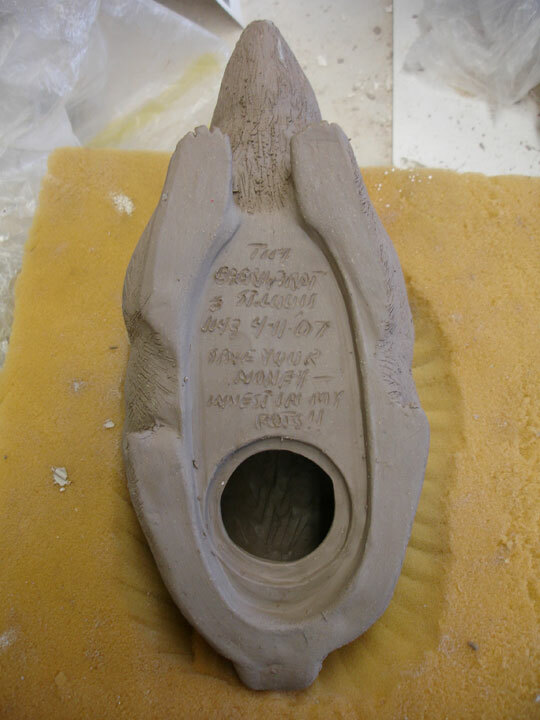 I constantly wonder if it might not be better to make safe and consistent pots as most potters seem to do. NAAAA! I mixed up a new glaze that looked great on a small test tile and I got a bit carried away and used it heavily in this load. The unforunate results are down the page. Since I get a kick out of the functional stuff, I glazed a number of bowls and cups. 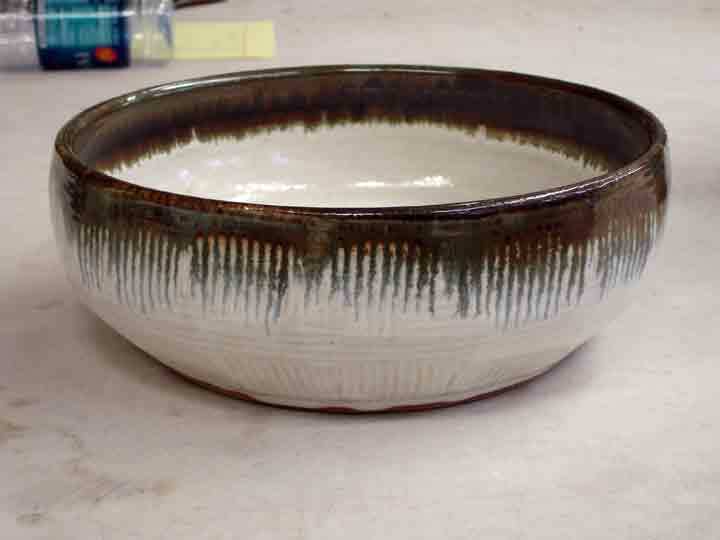 This is a nice 12" bowl. More beer mugs for poker night. 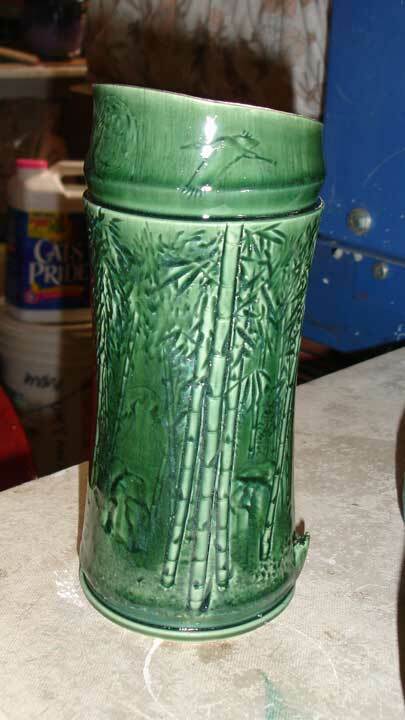 OK, that new glaze looked great on a small tile, but turned into Olive Drab on pots. These are nasty looking pots. I'll be reglazing all these. There is good in this though. 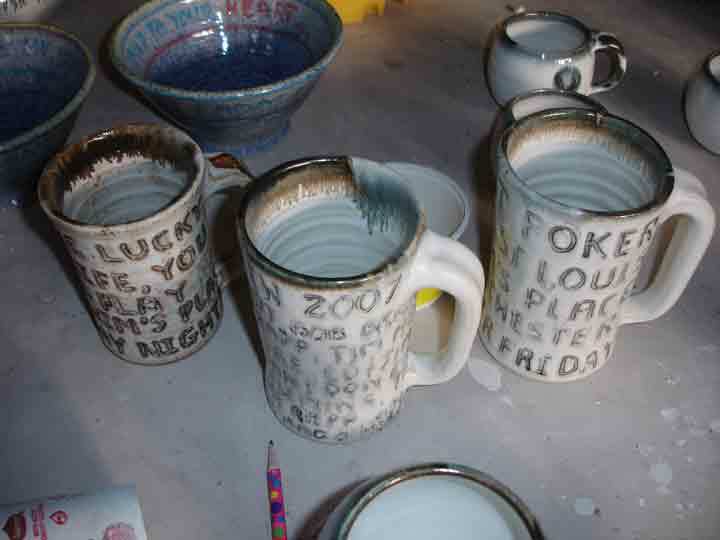 I will be doing some more glaze tests to see how I can turn these pots into treasure. In fact, as I write this, the test kiln is cooling down and there are twenty test tiles in the kiln that may show the way. Something about these painted ladies that I like. 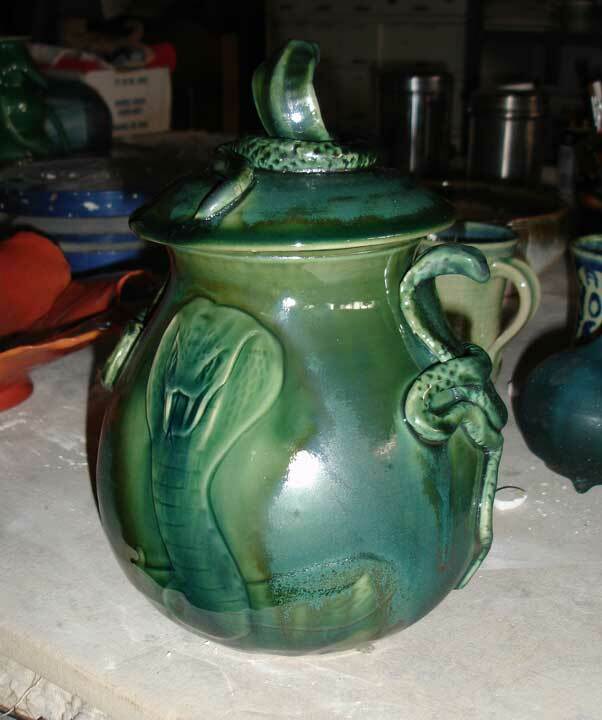 This strange pice is a "personal art pottery history" pot. Hey, I just make them. I don't explain them! And I made this for the historians down the line. A very nice Bamboo pot. 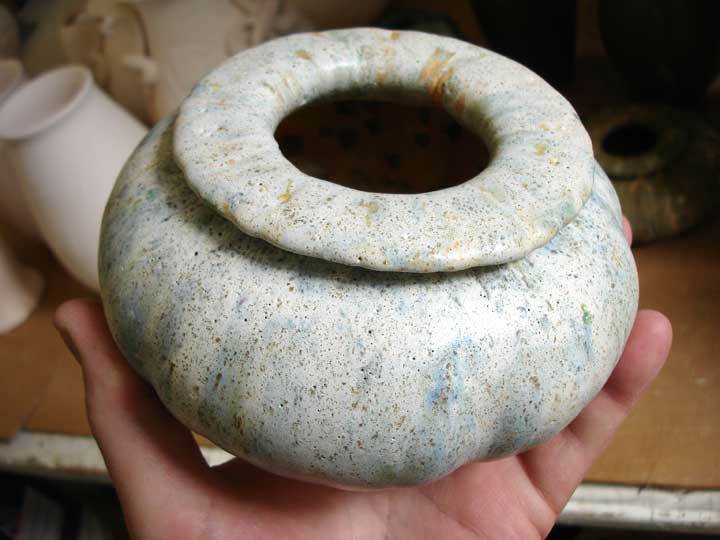 To appreciate this pot and it's companions, you have to see and touch them The glaze is wonderful. 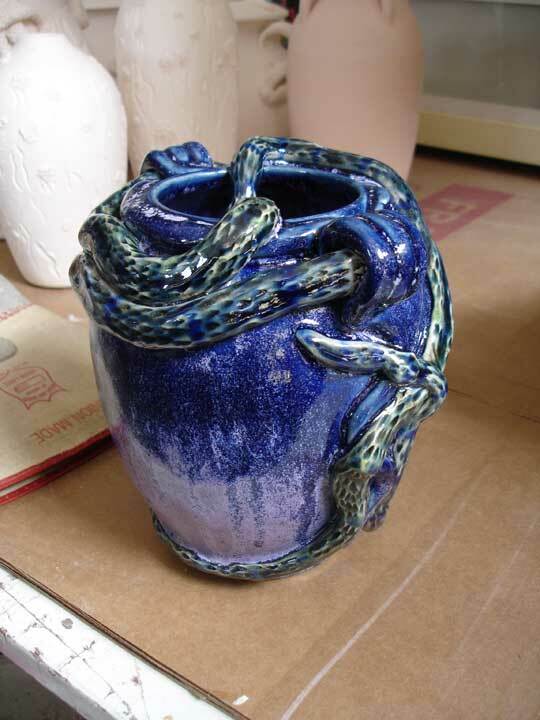 The first Snake Charmer Pot after the third firing. Ya, I am happy with it now. 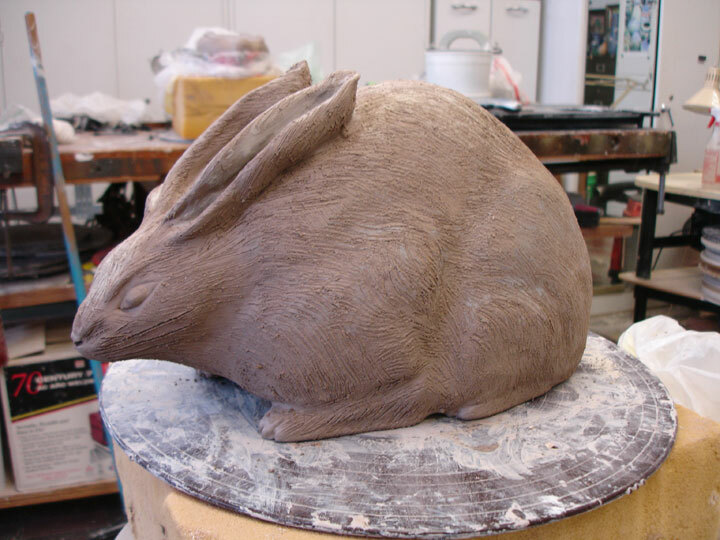 I am glazing, glazing, glazing.